First, if we go back just one verse, verse eleven, it clearly says that “God was doing extraordinary miracles by the hands of Paul” (Acts 19:11, emphasis mine; ESV). Nowhere else in the book of Acts are miracles said to have occurred specifically through the medium of handkerchiefs and aprons by the hands of someone other than Paul. Certainly there were other believers – like Peter, who was an apostle – used by the Lord Jesus to perform miracles, signs, and wonders. Though it was rare, God even performed miracles through believers who were not apostles. Stephen was one (Acts 6:8), and Philip was another (Acts 8:6-7). But what was reported to have happened through the apostle Paul in Acts 19:12 was unique, special. Therefore, it should not be viewed as normative and applicable to all believers, or even just to some who claim they have been called by God to be faith healers. Second, remembering the fact that Luke was writing under the inspiration of God the Holy Spirit and had a penchant for being detailed in his accounts, please note the text says that the cloths and linen garments “had touched his skin” (Acts 19:12; ESV). The way this reads is the cloths that people had on them somehow came in contact with Paul’s skin. Paul, therefore, was a passive participant. He didn’t stand up and proclaim to people that he had a special anointing exuding from his pores and they needed to bring him their handkerchiefs and aprons, so that he could touch them, and then they could take them back to the sick to be healed. Paul didn’t pray over the cloths. He didn’t lay hands on them (If Paul did “lay hands,” Luke would have plainly said so, as he did in other passages of Acts – see Acts 19:6). 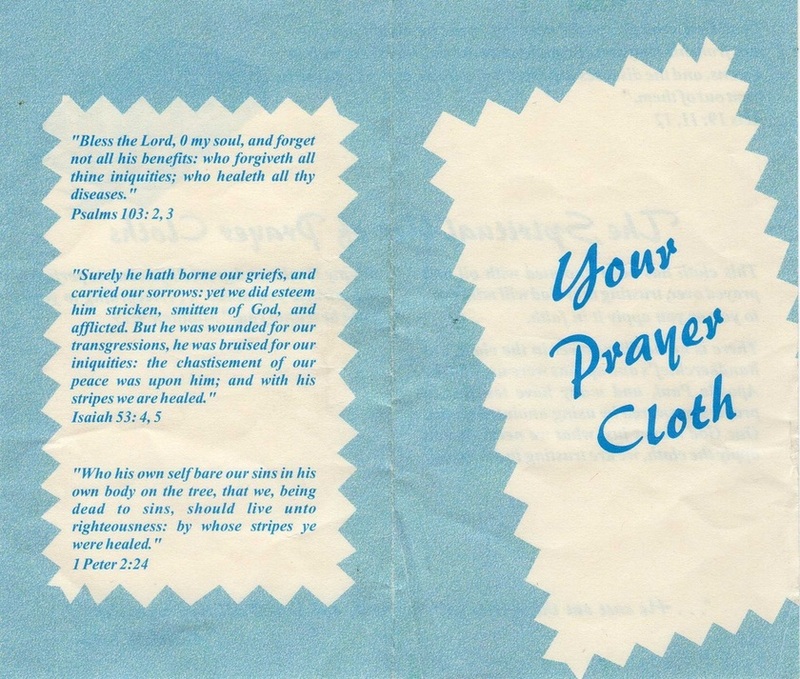 People had the cloths with them and they somehow touched his skin and God miraculously healed the sick when those cloths and garments were laid upon them. Also note, Paul didn’t subsequently launch a healing-in-my-skin-prayer-cloth ministry or host crusades with said name. Third, and finally, the reason this rare occurrence in Acts 19:12 shouldn’t be seen as normative today or sought out by believers to be replicated in their ministries is because miracles were primarily designed to confirm the gospel of Jesus and the ministry of the apostles (2 Corinthians 12:12; Hebrews 2:3-4) during the apostolic age and among new or unreached people groups at that time. So to those who are sick or seeking healing from God for a loved one who is ill, keep your handkerchiefs and garments. No need to send them in to a faith healer along with your financial faith seed. If you are a believer in Jesus, you can pray to God for healing yourself (James 5:13a). If it is in his will to heal you (with or without medicine), you will be healed. If you are not a Christian, my prayer is that you would be willing to view this video, hear God’s great love for you in Jesus and, in response, place your trust in Jesus for salvation from your sin and to be made right with God. If you are a fellow believer in Christ, my prayer is that our hearts would explode with gratitude for the sacrifice Jesus made for us, saving us from eternal wrath, forgiving us of our sins, imputing his perfect righteousness to our account, reconciling us to God, giving us a new nature/life, and securing for us eternal life. As my wife, daughter, and I are cruising at 30,000 feet heading back to Dallas, TX from Miami, I couldn’t help but to take a moment and reflect on what occurred during our family vacation this past week. After spending five days on a cruise we had it in our itinerary to spend a night in Miami, Florida. So on yesterday, we landed at Miami International Airport and hailed a taxi to our hotel, which was a couple of blocks away from the renown Ocean Drive. After checking in, we decided to take a stroll on SOBE (South Beach). The beach and overall scenery was cool, and the weather was sunny and warm. As we proceeded down the street, we saw signs that some type of event was scheduled to take place: tents, sponsors, music, police cars, and barricades. Of course we wanted to know what we had unknowingly stumbled into, so that we could possibly take part in the festivities. It didn’t take long for us to figure it out because there was rainbow paraphernalia everywhere. It was Miami’s Gay Pride parade. Considering all the things that were going on around the parade, and even in it, we decided it was best to not stick around too long and move away from all of the activity. While we were doing so, the wife discreetly said, “When I tell you, please turn Desirae around to your right. One, two, three…now.” As I did an about-face, I understood why she requested I do so. There was a man with his face painted red, fully dressed in a folk art costume depiction of the Devil: a red body suit and horns. I thought he was just there as a part of the crowd. But as the parade commenced, I actually saw him dancing in the parade. Shortly thereafter, we saw two street preachers walking among the bystanders with signs and preaching to them about Jesus’ redemption from sin, God’s love and truth, repentance, and eternal judgment. Almost immediately they were confronted and castigated by a handful of attendees. And, no, I didn’t say I was grieved by the street preachers. Whereas I would more than likely not have employed some of their methods, I unequivocally agreed with their message, our message, God’s message – the gospel of Jesus – and the accompanying need for us to place our trust in Christ to be saved from and forgiven of sin and to be reconciled back to a right relationship with God. I must say that I was also grieved by the pride that many people exhibited on that Sunday morning. Anyone who takes an honest, cursory read through the Scriptures will notice that God requires us to humbly turn from our sin to be saved, not to pridefully revel in it. To do the latter, resembles what Jesus said in John 3:19, “And this is the judgment: the light has come into the world, and people loved the darkness rather than the light because their works were evil.” We will do whatever it takes to keep our thoughts and actions from being exposed as sinful, even if it means redefining bad as good and saying Jesus authorized it. And the truth is there is someone who actively comes alongside to enable us in this twisted endeavor, “In their case the god of this world has blinded the minds of the unbelievers, to keep them from seeing the light of the gospel of the glory of Christ, who is the image of God.” (2 Corinthians 4:4). His name is satan. I found it ironic to see a man dressed in a devil’s folklore get-up attending this festival. It was, for me, a natural picture of what the devil does spiritually. He keeps us blind to the gospel, deceiving us with false religions and teachings that tickle our ears, and dances with us in our rebellious parades, all the while knowing that unless we trust in Jesus’ redemptive work on the cross and resurrection from the dead, we will face the music of God’s righteous judgment against our sin one day; a tune that he goes to great lengths to change the notes to, so that we will continue to dance straight to our own damnation. But thanks be to God that Jesus has destroyed the works of the devil (1 John 3:8), rendering his deception ineffective by the conviction of the Holy Spirit through the faithful proclamation of the Good News (and the Bible overall), and securing deliverance from sin and judgment through his redemptive work for all those who believe. Those were the words of an actual sign I saw on the side of the road as I drove back to my office today. The major issues that this professionally-made sign points to don’t escape me: the low societal view (and treatment) of the poor and of human dignity, and the tension, at times, between giving versus enabling. As important as these matters are, my mind, for the most part, went to something altogether different. You see, someone didn’t take too kindly to what was written and took it upon himself or herself to edit the message by cutting out the word “don’t” making the sign read: “Please ______ give money to beggars on this corner…” Obviously, one could just mentally fill in the blank to get the intended message of the author. With that being said, I couldn’t help but see a correlation between what an individual did to that sign and what some people do to the Scripture – God’s message, His “sign,” if you will. They may not cut out words and sections of the Bible literally, but they do hermeneutically. That is, they interpret the Bible in such a way that they in effect change its message. They cut it to fit their own desires, which only means that it is tailor-made for their destruction (2 Peter 3:16). November 16, 1994. I remember that day so vividly because that was when I received confirmation from God that He had called me to preach. I was 17 years old. I preached my first sermon that following month at First Baptist Church in Austin, TX (and, yes, I can recall the text and title of my sermon. But there’s no need to share that. Why live in the past, right?). Since then, God has graciously afforded me opportunities to preach His word and to learn, via experience and observation, some lessons on pulpit etiquette along the way. Here are some do’s and don’ts when you are invited to preach at a church as a guest minister. Keep in mind these are simply general rules of thumb and should, therefore, be adapted to the context you find yourself in. There have been a couple of times when my pastor, Dr. Karry D. Wesley, has had to pull me aside to correct me for preaching too long. I understand the reason for this now better than I did at the time. Generally, people are accustomed to the primary preacher’s sermon time and will quickly become mentally fatigued and irritated if a guest minister exceeds that. Many will check out on you and some might even get up and walk out. It is better to leave people wanting to hear more than for them to leave having wished they heard less. So, be sure to ask how much time is allotted for you to preach, and then do your best to honor that. I’d rather be an original me than a copy of someone else. Don’t get me wrong. When it comes to preaching, it is okay to learn from, even admire within reason, those who are more experienced and developed than you. But whatever you do, don’t try to become them. There is only one [Insert Your Favorite Preacher’s Name Here], and there is only one you. The people to whom you are preaching will appreciate it too. Congregants might be flattered at first that you look up to their pastor to the point to where you seek to mimic his preaching delivery, but after a while you will grow stale on them. People can smell inauthenticity from a mile away. Find your voice. Get comfortable in your preaching skin. Be you. In many cases, pastors will give you leeway to preach on whatever the Lord puts on your heart. I have recently found it to be a welcomed courtesy by pastors when I informed them of my sermon plan ahead of time. If the people dress formally when they attend service, then follow suit. If members don flip flops, pants or shorts, and tropical tee-shirts (shout out to Pastor Rick Warren), put some lotion on those feet, legs, and elbows and join in. If there are no preferences, then wear your normal getup. The point of you being there anyway is to declare God’s word, not to display your wardrobe. If while preparing your sermon, you have this thought, “Oh man. This is for sure going to be a controversial message because I know where they stand on this issue.” then it is probably best that you not preach it. If the issue is a core conviction of yours and would violate your conscience to preach at that church, then it would be better to not accept the invitation or to rescind your confirmation. Before you begin reading your text, it is a good practice to let the congregation know what version of the Bible you are preaching from, especially if you know the pastor uses a different one for his sermons. If the congregation normally remains seated while the preacher reads the text, please honor that. If it is customary for them to sing a closing doxology, or to invite the preacher back up to have final remarks before dismissing in prayer, then comply. Simply put, respect the house. Seek to make an impact, not to impress. And the only way to do that is to allow the word of God to be the road upon which your sermon travels, rather than a runway by which it takes off. Stick to the text and watch God change hearts and destinies through our finite efforts to communicate His holy word. Unless you have a good reason, don’t arrive just in time to preach. In my mind, you are not on time. You’re late. So arrive early. But things happen. Your flight is delayed. You get stuck in traffic or lost on the way to the church. These types of incidences are understandable. Just be sure to contact the pastor or someone at the church to inform them of your situation. Don’t leave the host pastor hanging, causing him to constantly check the time, wondering – as he begins to toss around options in his head if you are a no-show – what is going on because he hasn’t heard from you. Don’t taxi on the runway too long, otherwise your “passengers” will become frustrated and impatient. Take only the needed time to appropriately acknowledge the host pastor and congregation, and those who are associated with you, and then get the sermon off the ground. Don’t say that you and the pastor are close friends when you know you two are merely acquaintances. Your pretense will run the risk of creating offense. Be cordial and grateful with all sincerity and truth. Don’t preach for 45 minutes and then sing an impromptu invitational medley for 10 minutes. Unless you’ve been given permission, don’t extend the invitation to discipleship or salvation, or an altar call (i.e., calling people to the front of the stage for prayer). Don’t publicly ask for permission from the pastor to do something that should have been asked privately. Don’t seek to raise a love offering for the pastor. Don’t call for charismatic worship demonstrations in non-charismatic churches (e.g., encouraging all worshipers to speak to God in tongues, or to run up to the altar and place a “faith seed” at your feet, etc.). Just preach and then take your seat. It is tempting to try and wrap up some loose ends of your sermon near the conclusion of the service, but don’t do it. Don’t add another point before you give closing remarks. Don’t re-preach your sermon in your benedictory prayer. Trust God that all that was said was exactly what was needed for that time. No more, no less. If I could borrow a title from one of John Piper’s books and tweak it for this point, let me say, “Brothers, We Are Not Celebrities: A Plea to Pastors/Preachers for Humble Ministry.” I will never forget the time a guest minister was invited to preach at my home church in Austin. Why, when we went outside to check if he had arrived yet (he was late, by the way), did we see him pulling up in a stretched limousine? Oh, but it gets better – or I should say worse. The driver gets out, proceeds to the back, and opens the door for he and his wife. His wife exists first and then he follows. When I tell you this brother looked like he took a page out of Flava Flav’s book (no disrespect to Flav), I am not kidding at all. This brother had rings on almost every finger and a few chains around his neck. But seeking in my heart not to judge a book by its cover, we approached the limo, greeted them, and quickly escorted him to the pulpit. Honestly though, I was skeptical. Well, when he opened his mouth to preach, suffice it to say my suspicions were confirmed. Brothers, when we step on – and off – the stage, may pride be low and humility high, and may it be our ambition for Jesus to get all the shine.